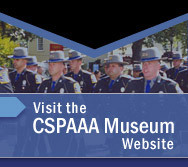 Along with newsletters and supplements distributed to members, the CSPAAA shares news and events online that will benefit both members and the general public. If you would like to see other news articles featured on the site, please contact us. Dora B. Schriro, a respected attorney who has spent much of her career running prisons and never served as a street cop, was nominated Monday to serve as the next leader of the Connecticut state police. State police said they busted a major marijuana growing operation in eastern Connecticut, and confiscated plants worth more than a million dollars. Police need more than the hypothetical possibility that a driver would be distracted or could not see because of the item dangling from the mirror.